600 min. Showtime. Director: John Dahl. Cast: Michael C. Hall, Jennifer Carpenter, Jimmy Smits, James Remar. In its third year, Showtime's brilliant thriller serial Dexter proved more diabolical than ever. The series has always been a sly examination of trying to pass as normal while hiding a devious dark side, even as the show suggests that normality itself is an illusion: who, after all, doesn't have a dark side. Still, Dexter's is darker than most. 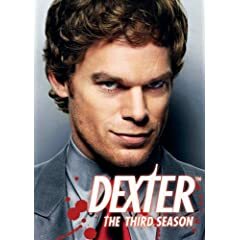 A serial killer whose day job is with the Miami-Dade Police Department, Dexter Morgan (Michael C. Hall) may be a crusading vigilante, but his actions come less from moral choice and more from his compulsive heart of darkness. 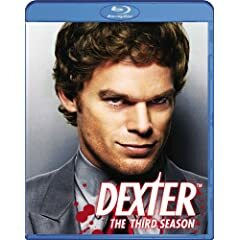 Dexter's job as forensic examiner puts him in a unique position to defend his secret identity and to select his prey: the worst of criminals who escape conviction through legal loopholes. It's no easy task moonlighting as a serial killer while maintaining a relationship with a single mother of two (Julie Benz's Rita) and working alongside his cop sister Debra (Jennifer Carpenter, Hall's real-life wife). The rest of his trusting co-workers—Lt. Maria LaGuerta (Lauren Vélez), Sergeant Angel Batista (David Zayas), and fellow lab tech Vince Masuka (C.S. Lee)—pose little problem, though Dexter remains haunted by memories and visions of his foster father Harry (James Remar), who serves as Dexter's conscience. Dying family friend Camilla Figg (Margo Martindale) brings certain memories to the surface, while posing a new moral question to Dexter: would he consider euthanasia? Dexter has already exorcised a number of demons involving his decidely non-nuclear family, and he has proven capable of besting adversaries that threatened to upset the balance of his work and home lives by directly or indirectly revealing his secret. Season Three focuses on the provocative question of whether or not a serial killer can have a best friend with whom he can share his deepest, darkest secrets and perhaps even the euphoria of the pastime of killing. Just as Season Two featured a season-long character arc for guest star Keith Carradine, Season Three brings in Jimmy Smits to play Dexter's potential friend, bloodthirsty A.D.A. Miguel Prado. The ensuing tangle springs from the killing of Miguel's corrupt brother Oscar; unbeknownst to Miguel, Dexter killed Oscar—in self-defense—while going after a drug-dealer named Freebo. Miguel sees a kindred spirit in Dexter, one who can help to find his brother's killer. When he susses out Dexter's identity as a serial killer, Miguel sees an opportunity to learn the ropes in anticipation of taking revenge for his brother's murder. The dangerous game that ensues over twelve episodes powers Dexter's most intriguing season yet. In the mix are at least three active serial killers, including Dexter, and the knotty plot steadily tightens with suspense as the eventful season finale approaches. Through it all, Dexter has to play it cool, a task made harder than ever by his rapidly approaching wedding to Rita. Hall continues to do brilliant work, thus far unrewarded by an Emmy (though he has been twice nominated), and Smits masterfully owns the role of Prado, the ultimate in loose cannons. As it heads into its fourth season, built around guest star John Lithgow and overseen once again by executive producer Clyde Phillips, the devious Dexter is at its creative peak. On Blu-ray, Dexter looks sharp as its anti-hero's blade. Bold color and vibrant depth and detail make the picture pop in The Third Season set. Nighttime scenes get grainier, but I'm convinced Showtime is making the most of its HD source material, which shows a step up even from the previous Blu-ray sets and certainly over the standard def DVDs. The true picture is met with Dolby TrueHD 5.1 surround sound that's equally up to the task of accurately transferring its source material: though Dexter isn't as show-offy or noisy as a lot of Blu-ray material, the results are clear and reasonably immersive. All of Dexter's bonus material is available via BD-Live, so your player must be hooked up to the internet to access it. As usual, the BD-Live content includes bonus episodes from other Showtime series (two each from United States of Tara and The Tudors) as well as other Showtime.com material. Specifically for Dexter, you'll find "Dexter by Design - Book Excerpts" and interviews with Michael C. Hall, Julie Benz, Jennifer Carpenter, Lauren Vélez & David Zayas. While I understand Showtime's desire to drive viewers online to their investment in web content, I'm not alone in preferring to see special feature content included on the discs themselves. Still, the show's the thing, and Dexter leaps to life in hi-def. All site content © 2000-2019 Peter Canavese. Page generated at 04/24/2019 07:48:06AM.